Peabody Energy, the largest coal company in the US and one of the largest in the world, is once again embroiled in controversy over shady treatment of employees. In 2007, Peabody Energy created Patriot Coal, a spin-off company comprised of Peabody’s eastern US mines. According to lawsuits involving the United Mine Workers (UMW), Patriot was formed as a place to stash union mines in West Virginia and the Midwest, along with the significant pension and health-care obligations that these eastern mines held. According to UMW, Patriot was essentially a "company created to fail," to give Peabody Energy and Arch Coal (another major US coal company who sold union mines to Patriot) an easy way to avoid paying union pensions and health-care benefits, while continuing to profit from their giant, nonunion surface mines in the Powder River Basin of Montana and Wyoming. Once Patriot declared bankruptcy, which it did last July, all of the pensions and medical benefits Peabody was obligated to pay their workers were put on the chopping block, just as Peabody had hoped. If Peabody succeeds, 10,000 retirees and another 10,000 dependents will lose the benefits promised them. Now, retired mine workers who labored for Peabody under the promise that they would receive health care and pensions, are outraged. Protests have forced Peabody to move its annual meeting to Wyoming, to avoid the civil disobedience by coal miners in the east. This is just the latest chapter in a long history of deceptive and exploitative practices by Peabody Energy and the coal industry in general. The American Coalition for Clean Coal Electricity (ACCCE), a coal front group funded by Peabody claims “Coal = Jobs.” But Peabody’s callous treatment of pensioners exposes what math the coal industry really cares about. Twenty four hours before the first presidential debate, the American Coalition for Clean Coal Electricity (ACCCE), a front group for the coal industry, has launched a new ad as part of a $35 million dollar PR campaign. The new ad, now playing on television stations around the country, is typical of the coal industry propaganda prominent in this year's presidential election. Candidate Mitt Romney has mirrored coal industry messaging, releasing political ads decrying President Obama's"war on coal" and announcing "I like coal" during the first presidential debate. A Greenpeace investigation that looked in to the history of coal funded advertising has revealed that the coal industry has been using the same scare tactics designed to limit regulation since the 1970's, when the Clean Air Act and Acid Rain legislation forced the industry to invest in a modicum of environmental protection, like scrubbers for smokestacks. In this new campaign, Big Coal’s PR flaks at ACCCE have recycled the same tactics of attacking the EPA, promoting the myth of clean coal, threatening economic catastrophe, and stoking nationalist fears that the industry has used for decades. With emotive piano riffs and sweeping shots of baseball diamonds for backdrop, the narrator in ACCCE’s latest creation praises the “proven clean coal technologies that have resulted from a can do attitude,” with all the sappy sincerity of a political ad. The ad continues with a stern warning that “heavy handed EPA regulation” and “fads” like renewable energy are “giving those countries who are wisely increasing their reliance on coal an economic advantage,” while pictures of the great Wall of China scroll over the screen. ACCCE’s brand new $35 million dollar ad campaign relies on the myth of clean coal, attacks on EPA, and an appeal to xenophobia…sound familiar? It should. In this 2012 ad a narrator warns that EPA regulations designed to reduce the amount of mercury released by coal fired power plants will “throw even more of us out of work.” The ad makes no mention of the dangers of mercury, a pervasive toxin that causes serious mental and physical issues, especially in children and pregnant women. However it does make one of the most common coal industry threats – that people must choose between the environment and a healthy economy. The ad claims that the Clean Air Act, a seminal piece of legislation that has drastically reduced air pollution and saved countless lives, will cause “galloping unemployment.” Regulate coal – lose your job. This 2007 ad reminds us that regulating coal makes dictators smile, because coal regulations force America to buy natural gas from unfriendly foreigners. Yep, having clean air and water plays right in to Hugo Chavez’s hand. Who knew? According to American Electric Power, (which is now a major funder of ACCCE) legislation to stop acid rain will result in middle-eastern petro-princes buying all of America’s coal. The ad says “The middle east oil companies are fast capturing the world’s money. There isn’t much they’re incapable of buying. So it could happen.” Almost as chauvinist as it is logically incongruous, this ad underscores the coal industry’s reliance on completely baseless claims designed to scare legislators and the public into inaction. Next they will be telling us that attempts to measure air pollution will make the lights go out and we won’t be able to watch TV! This ad (right) warns us that the EPA’s plan to measure pollution at the top of coal smoke stacks would shut down power generation, causing blackouts. Terrifying! Except the EPA went ahead and measured pollution from the top of the coal stacks, and there were no blackouts due to EPA regulation in 1975, or since. So what does that tell us about claims by pro-coal politicians that EPA regulations will cause blackouts this year in 2012? Senate republicans claim that “EPA’s train wreck of new regulations on energy providers will destroy jobs, raise electricity prices, threaten the reliability of the electric grid, and increase the chance of blackouts.” Should we believe them? Or is this just one more lie from a fear mongering industry that has been making the same idle threats for almost four decades? The Southern Company is not only polluting the environment with carbon and other dangerous emissions -- it's also polluting the debate over climate policy by funding bad science. Photo: National Geographic. Written by Sue Sturgis. Crossposted with permission from Facing South, the online magazine of the Institute for Southern Studies. Last week Fortune magazine named the Southern Company a top utility for the sixth year in a row, citing its "wise use of corporate assets" and "social responsibility." The nation's fourth-largest electric utility is headquartered in Atlanta and serves more than 4.4 million customers in the South through its subsidiaries Alabama Power, Georgia Power, Gulf Power and Mississippi Power. But the good press was soon followed by bad: Two days after Southern received Fortune's honor, the news broke that Greenpeace and the Virginia-based Climate Investigations Center obtained documents through a Freedom of Information Act request revealing that the company was the leading funder of a controversial scientist whose work has been used to raise doubts about the overwhelming scientific consensus that human activity is causing climate change in order to stall regulatory action. The Southern Company is the top carbon polluter among U.S. utilities and the eighth-biggest in the world, according to Carbon Monitoring for Action. The documents show Southern provided more than $400,000 between 2006 and 2015 to fund research by and part of the salary of Wei-Hock "Willie" Soon of the Harvard-Smithsonian Center for Astrophysics -- more than a third of Soon's total funding. In return, Soon and Harvard-Smithsonian gave the utility the right to review his scientific papers before publication while promising not to disclose the company's funding without its permission. Other contributors to Soon's work revealed in the documents include oil and gas giant ExxonMobil and the American Petroleum Institute -- corporate funding sources that in some cases Soon failed to disclose in violation of journal policy. The Smithsonian has asked its inspector general to review Soon's ethical conduct. In addition, three U.S. senators -- Edward Markey (D-Mass. ), Barbara Boxer (D-Calif.) and Sheldon Whitehouse (D-R.I.) -- sent 100 letters to fossil fuel companies including Southern, trade groups and other industry organizations seeking to unearth the extent of what they call "climate denial-for-hire programs." "We've known for many years that the tobacco industry supported phony science claiming that smoking does not cause cancer," said Boxer, ranking member of the Environment and Public Works Committee. "Now it's time for the fossil fuel industry to come clean about funding climate change deniers." Soon, an aerospace engineer whose work has depended heavily on funding from fossil-fuel interests, has promoted the hypothesis that the sun causes climate change, making him a favorite of the climate change denial crowd. He has served as an adviser to various denialist think tanks and has spoken at denialist conferences. Soon's scientific work has long been controversial, with a widely criticized 2003 study he co-authored with astronomer and fellow climate change denier Sallie Baliunas leading to theresignations of several editors who were involved in the journal's peer-review process. The publisher eventually admitted that the flawed study should not have been published. Scientists have pointed out various weaknesses in Soon's work, such as misinterpreting other scientists' data and relying on obsolete information for analyses. Some have noted an even more fundamental problem: Soon's claim that any evidence of a sun effect means carbon dioxide is not driving climate change. For example, in a 2009 article titled "It's the Sun, Stupid!," Soon wrote that because he has assembled evidence supporting the hypothesis that the sun causes climatic change in the Arctic it "invalidates the hypothesis that CO2 is a major cause of observed climate change." But this is a fallacy. It is equivalent to arguing that if total caloric intake correlates to weight, that exercise can have no effect, or that if cloudiness correlates to incident solar radiation at the ground, then seasonal variations in sunshine are zero. The existence of one physical factor affecting a variable in a complex system says nothing whatsoever about the potential for another physical factor to affect that same variable. The Southern Company has long been involved in efforts to mislead the public about climate change and to block regulatory action to curb greenhouse gas emissions. In 1998, as the United States was considering signing the international Kyoto Protocol treaty to limit global greenhouse gas emissions, Southern was part of an initiative called the Global Science Communications Team that brought together industry, public relations and think tank leaders to devise a plan to confuse the public about the state of climate science. The company's representative on the team was research specialist Robert Gehri, who was also Soon's contact at the utility. Though the Kyoto-era communications effort was supposed to be secret, a memo from the group written by an American Petroleum Institute representative became public. It said "victory" would be "achieved" when industry leaders, the media and average citizens "understand" uncertainties in climate science, and when recognition of uncertainties becomes part of the "conventional wisdom." It would measure progress by counting, among other things, the percentage of news articles that raise questions about climate science and the number of radio talk show appearances by scientists questioning the prevailing views. While the United States signed the treaty that November, the Clinton administration did not submit it to the Senate for ratification. The Bush administration rejected it altogether three years later. A decade after its efforts to block U.S. participation in the Kyoto Protocol, the Southern Company had become the nation's top lobbyist on federal legislation to address climate change by creating an emissions trading plan, which it opposed. A 2009 investigation by the Center for Public Integrity found the utility had nearly twice as many climate lobbyists as any other company or organization. While the House of Representatives approved the bill, it was defeated in the Senate. More recently, Southern deployed its lobbying power to block carbon emission limits for power plants proposed by the Obama administration. The Environmental Protection Agency plans to finalize the carbon regulations this summer, but they're now being challenged in court by 12 states and a coal mining company. In 2013, as the administration was preparing to roll out the rules, a lobbyist with a utility consortium told The Atlanta Journal-Constitution that the Southern Company devotes more resources to lobbying than most utility companies and is "very active in pushing its point of view." Indeed, the nonpartisan Center for Responsive Politics classifies the company as a "heavy hitter" for its generous spending on lobbying (over $12 million in the 2014 cycle alone) and campaign contributions (over $1.4 million in 2014, with most of that benefiting Republicans). Southern's campaign contributions have helped promote climate science denial in Congress. The top recipient of contributions from the company's PAC and employees in the 2014 campaign cycle was Sen. David Perdue (R-Ga.), who is part of what Climate Progress has dubbed the "Climate Denier Caucus." Perdue has accused the EPA of "overreaching" in its efforts to address climate change and has echoed the line Southern has pushed, saying that "in science, there's an active debate going on." And Perdue's not the only leading recipient of Southern's political support to help spread the questionable scientific talking points the utility has paid for: Rep. Gary Palmer, an Alabama Republican who received $18,000 from the company's PAC and employees in the 2014 cycle, last year told WATE that science "says global climate change is more a function of nature and solar activity than it is anything man does." Chalk it up as yet another "victory" for a company that last year raked in $2 billion in profits. Climate Scientists: Coal-funded #Fakexpert Willie Soon was Never Credible. Illustration by Thomas Avila for Greenpeace's Dealing in Doubt report (Cindy Baxter, 2013). "The science that Willie Soon does is almost pointless." Recent revelations regarding Smithsonian scientist Willie Soon's financing and coordination with fossil fuel companies for studies undermining the science of climate change has received quite a bit of attention. Our friends at the Climate Investigations Center have links to source documents, letters to the IRS and Congress, letters to journals that Soon appears to have mislead, and some of the press covering all of this. The drama has largely outshone the main point among most scientists: Willie Soon's work is vastly discredited. For those who aren't familiar with Willie Soon's fossil fuel company contracting over the last fifteen years, there is probably a legitimate question of whether or not this guy deserves to be in his current pinch. Frankly, he had it coming. Scientists and science reporters have often had to waste their time addressing the interference of Soon and his cohorts, who take advantage of the public's general unfamiliarity with scientific nuance. But scientists too are talking about Dr. Soon's work and what it means for the troubled peer-review process that the most stringent journals usually adhere to. Here is a summary of some of the most interesting conversations in science publications about Willie Soon's #Fakexpert scandal. "I'd have to say that I've reached my conclusions independent of Dr. Soon's work," Alcock said. "Dr. Soon is not actively engaged in actually gathering new data. He's principally disputing the interpretation of data gathered by other people. And I think this is an area where most of the progress will be made by people who collect new [climate] data or who build new models." Soon's industry-financed papers have been debunked by climate scientists over and over. Just last month, Soon co-authored a paper claiming to debunk decades of science using a "simple" model of long term temperature projections. Scientists worldwide noted that Soon's methodology was grossly oversimplified, ignoring key factors that scientists have warned will lead to unprecedented temperature increases in the coming decades. The Heartland Institute, a think tank with ties to the fossil fuel industry, paid to promote this paper in Science Bulletin, a journal published by the Chinese National Academy of Sciences. Heartland has misrepresented the Chinese NAS for political purposes before, and Science Bulletin was the latest victim of Dr. Soon's serial lack of disclosure of fossil fuel funding to science journals. Science Insider - published by the American Association for the Advancement of Science (AAAS) - interviewed editors at science journals who appear to have been fooled by Dr. Soon's non-disclosure of his industry payments. The evidence in my paper is consistent with the hypothesis that the Sun causes climatic change in the Arctic. It is the leap from the first to second sentence that drives Soon’s research – the notion that if you can find enough correlations to solar forcing, the impact of CO2 must be diminished, if not obliterated altogether. But this is a fallacy. It is equivalent to arguing that if total caloric intake correlates to weight, that exercise can have no effect, or that if cloudiness correlates to incident solar radiation at the ground, then seasonal variations in sunshine are zero. If you're feeling masochistic enough to read more from scientists into the documented gap between reality and Willie Soon's research, check older RealClimate posts on Dr. Soon here, here, and here, and this generously-detailed debunk of Soon's presentation at the latest Heartland Institute climate denial conference by ecologist Richard Telford. When it was announced that Soon was giving a talk at the University of Rochester, I knew it would be interesting. I was more than willing to hear what the man had to say. The whole point of being a scientist is, after all, to try to leave your preconceptions at the door and let the work speak for itself. I also wanted to understand Soon's own thinking about the role he was playing as a public skeptic. On all counts I was disappointed. Taken as nothing more than a scientific talk, Dr. Soon's presentation was, in my opinion, pretty bad. I watch a lot of these things. It's part of my job. If Soon had been giving a Ph.D defense, he would have been skewered. I was left without a clear line of argument or clear justifications for his claims. More importantly, for a topic this contentious there was insufficient discussion of the voluminous and highly detailed response critics have offered to his claims that solar activity accounts for most observed climate variability. Many of my colleagues listening to the talk said they felt the same way. I came away thinking, "Is that the best they have?" Claims that the Sun has caused as much as 70% of the recent global warming … presents fundamental puzzles. It requires that the Sun’s brightness increased more in the past century than at any time in the past millennium, including over the past 30 years, contrary to the direct space-based observations. And it requires, as well, that Earth’s climate be insensitive to well-measured increases in greenhouse gases at the same time that it is excessively sensitive to poorly known solar brightness changes. Both scenarios are far less plausible than the simple attribution of most (90%) industrial global warming to anthropogenic effects, rather than to the Sun. So in sum: It’s not that the sun can’t influence climate. It can, and it does. And climate scientists have accordingly been studying the influence of the sun for many years. Discover Magazine has a similar rundown of Soon's debunked "it's the sun" thesis, based on a video of a presentation Soon gave to a Koch-funded student group. Even Koch-funded scientist Richard Muller has abandoned Soon's solar theories in the face of overwhelming scientific evidence to the contrary, as Brad Friedman reminds us, in a study that Charles Koch Foundation itself helped finance (oops). Yet unlike 9/11 trutherism, and Obama-is-a-Muslim trutherism, the Climate Truther campaign has an air of respectability, a unanimous adherence among Republican presidential candidates. How is that possible? The answer is money. Lots of money. Billions of dollars, in fact, spent to create an entire industry of scientists, publicists, think tanks, and legislative organizations. Most of this denial is implemented through the vast web of Koch-funded front groups in the State Policy Network, with presence nationally and in all 50 states. For a look at how SPN uses science denial in the policy arena, check out Willie Soon's climate denial testimony to Kansas legislators from January, 2013. This dismissal of climate science to Kansas legislators marked the opening of a nationally-coordinated attack on Kansas' clean energy incentives by SPN members. In that case, Dr. Soon failed to disclose his payments from the nonprofit Charles Koch Foundation for his work, which he cited in the Kansas statehouse. Hence our letter to the IRS, asking about potential violations of law. The Charles Koch Foundation funded most of the groups working to attack the clean energy law, Koch Industries itself was lobbying against the law, and rumor has it that Willie Soon was flown in on the dime of Americans for Prosperity, a group founded, financed and governed by the Kochs. If you're John Stossel and you want to host a segment to rail against the US Environmental Protection Agency, who ought you call? It turns out, a man who was convicted and sentenced to six months in prison for defrauding the EPA! Stossel's guest last night, Jay Lehr, was sentenced to six months--serving three--in a minimum security federal prison back in 1991, and his organization at the time was fined $200,000. So Jay Lehr knows about EPA corruption better than anyone: he was the guy caught "falsifying employee time sheets on a government contract" for EPA, according to the Columbus Dispatch. Ironically, Lehr told Stossel that EPA is "fraudulent" in estimates of amounts of pollution that pose hazards to people's health, such as particulate matter in coal pollution, estimated to prematurely kill 13,000 Americans every year, according to the American Lung Association. Jay Lehr is now the "science director" at a climate chance science denying organization called The Heartland Institute, which has received money from coal mining company Murray Energy. John Stossel did not mention Lehr's fraud conviction. Perhaps he didn't know his guest defrauded US taxpayers, but Stossel and Lehr share a flair for denial of global warming for polluting corporations like Koch Industries, which has financial ties to both men. Heartland is part of the Koch brothers-funded State Policy Network--the massive apparatus of state-based and national front groups that push political agendas that are favorable to billionaire executives like Charles Koch. Heartland itself has received money from Koch foundations. Stossel hosts "Stossel in the Classroom," a product of the Koch-funded Center for Independent Thought. When Stossel ran a TV segment in 2009 that was intended to mislead students about the scientific reality of climate change, Koch's Claude Lambe Foundation gave CIT $35,000. The Center for Independent Thought has continued to receive money from Koch foundations every year since, according to IRS tax filings. According to a Heartland Institute email advertising Lehr's attendance on Stossel's show, Mr. Lehr's relevance in attacking the EPA comes from a Heartland report he wrote urging the agency to be "systematically dismantled." This coming from a group soliciting money from coal company Murray Energy, former ExxonMobil lobbyist Randy Randol and the Charles Koch Foundation. This all fits into the framework that is becoming nauseatingly familiar to American voters: billionaires pull the strings, and our voices don't matter. Stossel is just one of many Koch-funded or Koch friendly media personalities that wrap Charles Koch's values in patriotic rhetoric and un-factual packaging. Meanwhile, people like Jay Lehr at groups like Heartland continue to carry Koch's water into the policy arena, influencing politicians to do things like undermine enforcement of laws to reduce air and water pollution or mitigate dangerous climate change. Source: David Lore, "Minimum Security, Maximum Cost: State Spends $53,000 Per Prison Bed to House Mostly Nonviolent Criminals," Columbus Dispatch (Ohio) September 6, 1992. USA V. LEHR, ET AL, Case Number: 2:91-CR-00068, Charges Filed 04/26/1991, U.S. District Court Southern District of Ohio. Hat tip to Deep Climate, Russel Seitz and Thomas Miles for leading to primary sources on Jay Lehr's conviction. Bracewell & Giuliani's Jeff Holmstead, hailing the escape cab that never showed up. If you're a coal lobbyist like Jeff Holmstead, getting stuck in an elevator with Greenpeace activists is an inconvenient occupational hazard, especially if you then can't find a cab and cars are honking at your during an uncomfortable conversation about your work to attack pollution laws. See this K Street confrontation for yourself. If you've followed the news around EPA's proposed Clean Power Rule, which aims to reduce the U.S. power sector's large contributions to global warming, you've probably seen Jeffrey Holmstead in the news. Usually, Holmstead is presented as a "partner" at Bracewell & Giuliani, and as a former EPA assistant administrator for air and radiation under George W. Bush. This descriptor fails to present Holmstead's current and past work as a registered lobbyist for coal companies, and leaves out the destructive decisions that Holmstead made in his stint at EPA, which directly contributed to the premature death of tens of thousands of people in this country. It leaves out the $17.5 million that coal industry clients have paid Bracewell & Giuliani for its lobbying services, where Mr. Holmstead is a prized hired gun against the EPA. This is why I began our tense conversation with a simple question: why doesn't Jeff Holmstead use his skills, qualifications and experience to find real solutions to global warming? Every time Mr. Holmstead has appeared in the news to discuss the EPA's proposed Clean Power Rule to reduce U.S. carbon emissions, he doesn't have much good to say. "As someone who believes in the rule of law, I think this clearly goes beyond what EPA is allowed to do under the Clean Air Act,” Holmstead said at an event yesterday at the Bipartisan Policy Center, where I asked if his naysaying is simply to help Arch coal sell coal. Notice that Holmstead doesn't respond: see minute 7:30 in bottom video posted by BPC. Mr. Holmstead's criticisms aren't surprising for a coal lobbyist, but Holmstead rarely acknowledges his coal clients and instead uses his former EPA credentials and his legal expertise to help steer Washington DC politicians, lawyers and journalists toward the coal industry's interpretations of proposed environmental regulations. Holmstead likes to conflate rising electricity rates with the average consumer's utility bill, ignoring the proposed rule's well-known intent to reduce consumer bills through energy efficiency targets. This deceptive talking point was called out by Susan Tierney of the Analysis Group at yesterday's event at the Bipartisan Policy Center. Holmstead knows this isn't honest--he was previously called out by NRDC's Frances Beineke during a segment on The Diane Rehm Show. He talks about how reducing U.S. emissions won't make a dent in reducing global emissions, thanks to rising coal use in coutries like China and India, as if the U.S. first real national attempt to reduce emissions won't give us legitimacy in global climate negotiations. When I used this as an example of one of Mr. Holmstead's obstruction tactics. With the science understood, with the financial stakes so high and with shocking estimates of the current human death toll from global warming, why does Jeffrey Holmstead make a career working for an industry that is killing people? I don't have an answer, but I have sought one. For "someone who believes in the rule of law," Mr. Holmstead has found a lot of ways to protect coal company executives at the expense of other people, within the boundaries of law or outside of the boundaries of enforcement. Avoiding personal responsibility is nothing new for Mr. Holmstead. In 2011, I confronted him for his decisions to delaying mercury regulations at U.S. power plants for eight full years, a decision he made as head of the George W. Bush EPA's air and radiation office. That decision allowed tens of thousands of people to prematurely die from mercury's toxic effects, according to EPA estimates of the rule's health benefits. For someone whose decisions have had a terrible impact on the American public, Jeff Holmstead has faced little accountability for his sooty legacy. PolluterWatch will continue to monitor and expose the coal industry's work to undermine public health and public policies designed to solve problems their business creates. Well, this is the most embarrassed that the Heartland Institute has been since...21 days ago when they were run in circles for their denial of climate change at the National Press Club! To get a sense of how bad a month it has been for the liars at Heartland, footage of that humiliating event is available on Stark Reports. And now, hat tip to Lee Fang and Nick Surgey posting on Republic Report for this cringe-worthy confrontation of Heartland Institute CEO Joseph Bast's ongoing shilling for tobacco companies. Bast denied writing a 1998 opinion article dismissing the health hazards of smoking cigarettes. Watch him eat his own words, hard, as the ghosts of propaganda-past revisit him. Rather than accept the undeniable truth about cigarettes and cancer, Bast decided to stand by his own lies from over fifteen years ago. His article, "Five Lies About Tobacco," is still on Heartland's website. Funny how Bast suddenly remembered the piece after having it read back to him, blaming an anonymous pulmonologist he has lost contact with in order to defend the ludicrous claim that smoking seven cigarettes per day won't hurt you. Right Joe. I'm sure you remember that as of 2012, Heartland still solicited funding from tobacco giants Altria and Reynolds American for funding, according to Heartland's own fundraising plan. The clip was filmed at a coal industry convention. In recent years, Heartland has received funding from private coal mining company Murray Energy Corporation (MEC). CEO Bob Murray is so out-of-touch on climate science that other coal interests have trouble working with MEC, much like Joe Bast's extremely dishonest views even alienate others operatives in the small world of climate change denial. The coal industry’s efforts to export huge amounts of taxpayer-owned coal from Montana and Wyoming to Asia has generated unprecedented opposition in the Pacific Northwest - tens of thousands of people have rallied, attended public hearings, and called on their elected officials to oppose coal export terminals that would disrupt and pollute communities and pose one of the biggest threats to the climate of any fossil fuel project in the world. But one key coal export investor apparently hasn’t yet received the memo. Ross Bhappu, a partner at a Denver-based private equity firm called Resource Capital Funds, has been the main source of money for Ambre Energy, the shaky Australian company behind two of the three remaining coal export proposals in Oregon and Washington, the Millennium Bulk Terminal and Morrow Pacific Project proposals on the Columbia River. That’s why ten community and environmental groups wrote a letter to Ross Bhappu last month, calling on him and his firm to drop its investment in Ambre Energy and its controversial and risky coal export proposals. That’s also why we’ve launched a new website, www.RossBhappu.com. The website details how Ross Bhappu has used a $110 million bet on Ambre Energy - along with the company’s difficulties attracting other outside investment - to take more control of the company at the expense of other shareholders. We want to make sure that elected officials, investors, and communities that would be impacted by coal export projects know who is bankrolling these proposals. So check out the new website, read the details about Ross Bhappu’s bet on coal exports, and help us share the information. We’ll update the site with the latest news, so if you have a tip, let us know. On January 9th, Freedom Industries, a company that stores chemicals for the coal industry, spilled 7,500 gallons of Crude Methylcyclohexanemethanol (MCHM), a little known, little understood compound into the Elk river. The spill occurred one mile upriver from the water intake that supplies tap water for all of West Virginia's capital city of Charleston. The thick oily chemical was pumped through the water system and into homes and businesses throughout the area, causing vomiting, skin problems, and diarrhea. Now, nearly two weeks since the disaster was discovered, the water has been deemed "safe to drink," though water from the tap still releases a sickly sweet chemical odor, especially when heated. So little is known about 4-MCHM that regulators didn't even know it's boiling point. Now scientists are scrambling to find out how the chemical reacts with the chlorine in the municipal water system, and whether the chemical has leached into water heaters and water pipes in people's homes. Authorities recommend that all pipes that have come in contact with the pollutant be flushed, including water heaters and outdoor faucets. However, West Virginia American Water, the company that owns the water treatment facility contaminated by the coal chemical, is only offering a 10 dollar credit (1000 gallons) to consumers. The cost of flushing homes will therefore fall on already struggling West Virginians, where poverty is rampant and Walmart is the largest single employer. West Virginians still need fresh water. To donate visit Keeper of the Mountain Foundation. The affected intake also supplies water to 9 counties surrounding Charleston, which contain multiple rural communities, like the small community of Pratt. Pratt was added to Charleston's municipal water system only two months ago. This was initially celebrated by the residents of Pratt, because it meant relief from the extremely poor quality water from local sources, which have been contaminated by Acid Mine Drainage, coal dust, and other coal industry impacts. Water contamination from the coal industry is nothing new to West Virginians, who have lived with poisoned wells streams for generations. This spill, the latest and most dramatic in a long history of water contamination, exposes the problems of lax and inadequate regulation coupled with politicians that prioritizes the bottom line of the coal industry over the health and safety of people. The chemical 4-MCHM was exempted from federal laws that require disclosure. The tanks that held the chemical were not required to be inspected regularly, due to a loophole that exempted above ground tanks from inspection. 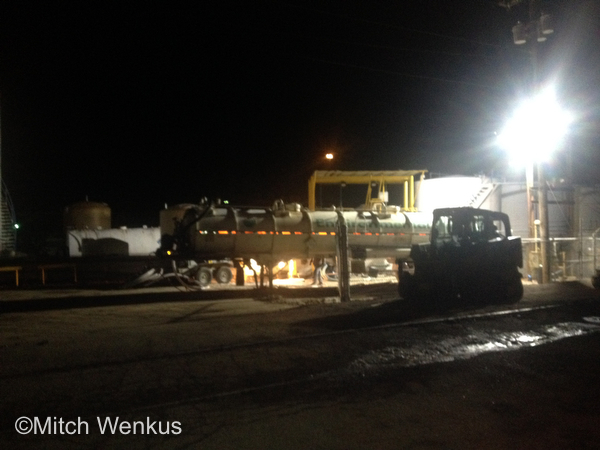 Crews continue to work on the site of contamination at Freedom Industries. West Virginian politicians with close ties to the coal industry have continued to defend coal companies from federal and state regulation, even as 300,000 of their constituents went without drinkable water. Speaking at an event hosted by the coal front group American Coalition for Clean Coal Electricity (ACCCE) last week, Joe Manchin, West Virginia’s junior senator and former governor continued to defend the coal industry from reglation. “Coal and chemicals inevitably bring risk — but that doesn’t mean they should be shut down,” said Manchin. “Cicero says, ‘To err is human.’ But you’re going to stop living because you’re afraid of making a mistake?” Manchin has significant financial ties to the coal industry. The current governor of West Virginia, Earl Ray Tomblin, was also quick to defend the coal industry. In a press conference days after the spill, he said "“This was not a coal company. This was a chemical supplier where the leak occurred. As far as I know, there are no coal mines within miles of this particular incident.” Governor Tomblin's remarks ignore the fact that many communities affected by this spill are only using municipal water because local sources have already been poisoned by coal extraction and use. Tomblin also ignored the fact that Freedom Industries' product is a necessary part of the coal extraction and burning process. 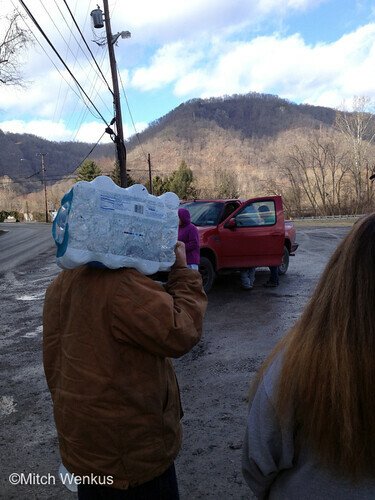 To donate water to West Virginians, please visit the Keeper of the Mountain Foundation. To volunteer or request clean water, visit the West Virginia Clean Water Hub. 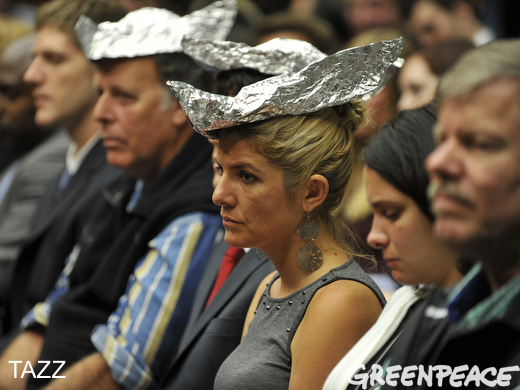 Greenpeace activists put on tin foil hats when Congressional climate deniers spoke at yesterday's Energy & Power subcommittee hearing. More photos. Written by Greenpeace's Bonnie Barclay with input from Connor Gibson. It might surprise quite a few who know me, but I'm actually quite a shy and introverted person. 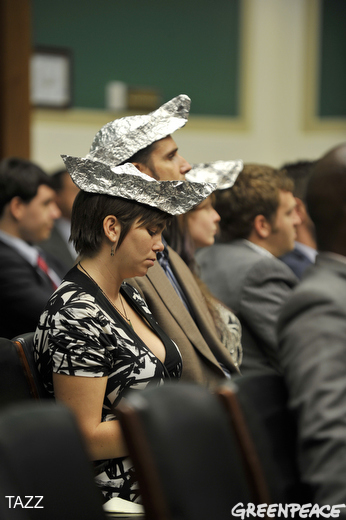 So what exactly moved me to show up at a Congressional hearing and put on a tin foil hat? Two words: Climate Deniers. Denying climate change is as bizarre and out-of-touch as tin foil hat conspiracies. Congressional climate deniers need to accept the science and bolster the President's actions with a tax on carbon pollution. That's why we brought our tin foil hats to yesterday's hearing, called together by the U.S. House of Representatives Energy & Power subcommittee chairman Ed Whitfield (R-KY). It focused on the Obama Administration’s Climate Action Plan, with Environmental Protection Agency Administrator Gina McCarthy and Energy Secretary Earnest Moniz testifying. Whenever the members of Congress started saying false things about climate change, we tossed on the tin foil hats. 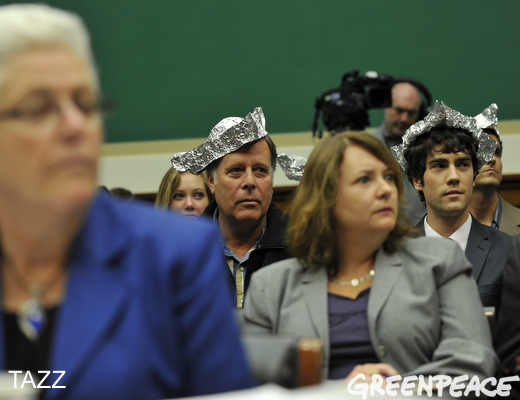 By the end of the three-hour hearing, the silly tin hats were on our heads for almost half of the entire event. Of all the politicians in yesterday's hearing who are known climate change deniers, West Virginia Rep. David McKinley gets the tin foil hat award for his completely false assertions about climate change science. Check out this CSPAN clip, starting at 2:01:26. First, Rep. McKinley said, "Over the last forty years, there's been almost no increase in temperature." He was attempting to undermine the reliability of climate models, which in reality have underestimated climate change. Worse, my jaw dropped when I heard Rep. McKinley claim that Arctic sea ice increased by 60% from last year to this year, a false figure he apparently got from a typo in a bad newspaper article! H/T @RLMiller--see NASA for the facts on how consistently and rapidly the ice cap has melted in recent years. Finally, McKinley completely misrepresented the United Nations Intergovernmental Panel on Climate Change (IPCC), saying, "Most experts believe by 2083--in 70 years--the benefits of climate change could outweigh will still outweigh the harm." Ummm...that is completely wrong. The IPCC has made it crystal clear that global warming is a very serious problem that demands immediate policy action if we have any chance of solving it. Perhaps the $391,000 McKinley has received from the coal industry explains some of his scientifically-irrelevant opinions--McKinley wrapped his speech up by promoting the coal industry. Climate deniers in Congress make their points not by stating factual information from peer-reviewed studies, but by quoting newspaper headlines. I'm pretty sure those were meant to sell newspapers, not settle a debate. The hearing was packed. People do care about what Congress is OR isn't doing on climate change. It's actually not the "do-nothing Congress," as Rep. Henry Waxman (D-CA) pointed out, it's much worse! "On Climate we're doing worse than nothing--we are affirmatively obstructing progress." [CSPAN, 38:25]. And she's right. A 2012 report commissioned by 20 governments written by "50 scientists, economists and policy experts" concluded that global warming already costs the world $1.2 trillion every year, and contributes to 400,000 annual deaths. In a week where we're seeing people's lives lost and communities devastated in Colorado by extreme flooding, the type of disaster we can expect more frequently thanks to climate change, one would think the urgency to act to avoid future economic devastation and loss of life would become crystal clear to those who we elected to represent us. Unfortunately, nothing seems to cause Congress to take action. It's like they missed the last year of weather events! You can see the distortion of climate denial in Greenpeace's recent report, "Dealing in Doubt", which summarized how industrialists like the Koch brothers have funding fake science and sheer misinformation to make us question the hard truth about climate change. So it comes as no surprise that Koch Industries is the second highest donor this election cycle to the chairman of yesterday's hearing, Rep. Ed Whitfield (R-KY), as well as other Representatives on the subcommittee, like Koch's hometown favorite Mike Pompeo, and Texas politicians Joe Barton and Pete Olson. I'm tired of seeing members of Congress put their head in the sand and deny climate change. It's an appalling manipulation of our future potential by people who are meant to represent us and do the right thing. So why'd I show up for the hearing yesterday? People's lives and livelihoods are on the line. The strength and future resilience of our country and our communities and all we've built as a nation are at risk if we don't do anything. We're not do-nothing people. We're Americans. We lead. We work. We improve. We build. We innovate. We need to stop the perpetuation of ignorance and denial. It will take some work to get there, so we need your help too. I hope you stand with me--extrovert or introvert--and join in saying enough is enough its time for action. There is no greater moment than now for us to come together and do the right thing on climate change.